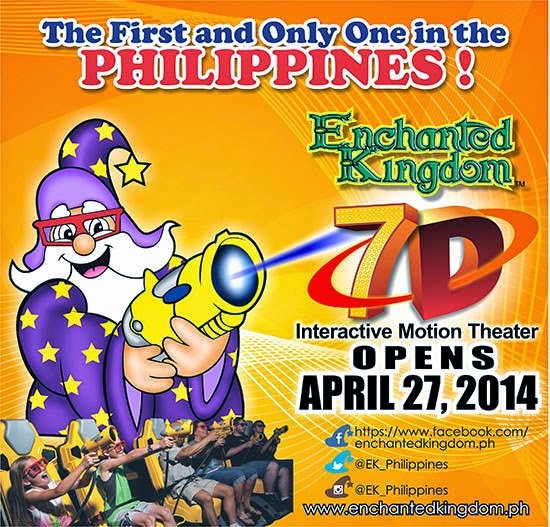 [i am a dekaphobic]: Enchanted Kingdom's 7D Interactive Motion Theater! Enchanted Kingdom's 7D Interactive Motion Theater! Summer is the perfect time to go out and bond with family and friends. One of the popular places to go to this season is Enchanted Kingdom. With my foodie friend, Jeng, I went back to childhood once more by exploring what the park has to offer. Who wouldn't love Space Shuttle, Rialto Theater in 3D, Jungle Log Jam, Rio Grande Rapids, EKstreme Tower Ride and Disk-O-Magic? The best part of the day was trying out the first and only 7D Interactive Motion Theater. Our ride was a zombie chase, with surprising twists that you'll really believe that you're being chased by zombies! Best shooters will be ranked at the end of the ride. It was an awesome ride that kids and adults would really enjoy. I had a great time that I wanted to do it again (and master my shooting skills. hehehehe). Oh wow I want to try! And for only 100 bucks why not?! Our family used to go to Enchanted Kingdom when we were kids. I remember being so amazed at Rialto. We haven't been to EK in a long time, the 7D looks interesting! But I think we'll wait until after summer, it's just too hot these days. I miss Enchanted Kingdom!! It's been years the last time I was there! Now, I want to try that 7D Motion Theater!!!! Wala pa yung jollibee pose mo kaya! hahahaha!!!! Haven't been in awhile but planning to go for our youngest's birthday. I see there are new attractions and rides. Thanks for the update!